Snorkeling in the cool spring waters of Florida's Crystal River, I could see a pair of mermaids straight ahead, resting on the bottom. One of them, needing a breath of air, glided silently upwards. Her huge nostrils broke the surface and, sounding just like a dolphin, she loudly inhaled a deep breath. Then she sank a few feet below the waterline, gave a slow flip of her broad tail, and returned to relax on the bottom. I've found manatees to be perfect snorkeling subjects since they spend most of their time dozing on the bottom. Their resting position is a peculiar one. Manatees don't lie flat but balance their weight on their head and tail only, and bend in the middle like a bow. It seems an awkward pose that would seem to require considerable effort but obviously not. It is always an eerie feeling to realize I may be watching a living fossil, a species in danger of joining the dinosaur and the mastodon as part of earth's past. Although some manatees are shy and reclusive, many actually seek out the company of snorkelers and like to play. You can tell when you've become friends with a manatee: he'll nudge you to have you scratch his head, or do a barrel roll and stand on his head so you can scratch his stomach. Like dogs, manatees sometimes want to be gently petted. Once you've gained an animal's confidence, it may follow you around like a puppy. I've had many follow me around and almost demanded to be petted or scratched. I've even had several stand on their head to entice me to scratch their sides and stomach. From December to mid-February, Florida's Crystal River is the only place in the world for snorkelers to swim with the West Indian manatee in relatively clear water. Crystal River and the town of the same name are located about 80 miles north of Tampa at the junction of U.S.44 and U.S. 19. For complete information on facilities at Crystal River, write the Crystal River Chamber of Commerce, 1801 Northwest Hwy. 19, Suite 541, Crystal River, FL 34429; or call (904) 795-3149. Located two miles from Orange City near Deland, Blue Spring State Park is one of the state's most important natural manatee wintering refuges. A half-mile boardwalk skirts the length of the spring run, making this the only place in the world where a herd of thirty to forty endangered manatees can be so easily seen from land. The boardwalk, which is easily wheelchair accessible, has several platforms extended over the constant 72-degree water which provide excellent views of the manatees, who winter here from around mid-November to mid-March. The spring flows into the St. Johns River. Once the St. Johns warms up, the manatee herd disperses until the following season. Since there is no vegetation growing in the spring run, manatees sometimes make short forays into the river for food during the winter. Since the early 1970s, the Miami Seaquarium has participated in the recovery and rehabilitation of more than 65 manatees. It also houses the most prolific manatee breeding colony anywhere in the U.S.
Over the years, Seaquarium researchers have found that the manatee's immune system is more developed than for most animals." It is for this reason that manatees are able to survive swimming in bodies of water like the Miami River," says Dr. Gregory Bossart, the marine park's chief veterinarian. Numerous incidents at the Miami Seaquarium continually demonstrate just how caring manatee mothers can be. For instance, a baby who suffered severe lacerations after being hit by a boat in Port Everglades was behaviorally adopted by a four-year old female who had never been a mother. Although the Seaquarium's rehabilitation area is closed to the public, visitors can view as many as a half-dozen manatees featured in the park's 90,000 gallon Celebrity Pool, which has both above and underwater viewing. Manatee education programs are presented at the pool three times daily. The Miami Seaquarium is located at 4400 Rickenbacker Causeway, Virginia Key, in Miami; (305) 361-5705. I've snorkeled with manatees for more than two decades while studying them for my book, "Manatees - Our Vanishing Mermaids". I've learned that if I want to see a manatee up close, it's best to let the animal approach me, not for me to see how close I can get to the animal. The key element to manatee watching is always let the animal make the first move. Sea World launched its Manatee Rescue and Rehabilitation program in 1976. As one of the state's three leading manatee rescue and rehab facility, it has many success stories. One is Violet, a featured member of the small herd of manatees at Sea World's "Manatees: The Last Generation?" Violet is one of several Sea World raised manatees displayed in the 300,000 gallon habitat made to resemble a lush tropical lagoon. Visitors can observe manatees either from the surface or enjoy a spectacular diver's-eye view of the small manatee herd through a 126-foot long acrylic panel that spans one side of the exhibit. United Technology's Living Seas at Epcot is home to a rare manatee family. 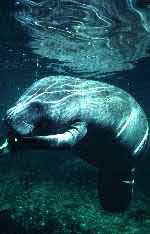 The mother is Lorelei, the first manatee conceived and born in captivity. Lorelei was born at the Miami Seaquarium in 1975 and has demonstrated that life in captivity suits her well. She gave birth to her own calf in the Living Seas pavilion in 1991 on a September 13, hardly an unlucky day at all. The birth was an unusual opportunity that allowed scientists to observe the birthing process almost moment by moment. Lorelei's water broke about 4:30 p.m., but the tail of her 71-pound calf didn't appear until around 8 p.m. The birth wasn't officially completed until 10:18 p.m. Located at 7530 North Boulevard, this small 24-acre zoo is ranked one of the top three for its size by the American Association of Zoological Parks and Aquariums. With 1,600 animals representing 272 species (including 31 threatened or endangered),), manatees are a main attraction. Lowry Park's Florida Manatee Hospital and Aquatic Center is a special rescue, care and recovery facility. Animals that regain their full health are released back into the wild. Located in Bradenton just north of Sarasota, the South Florida Museum is home to Snooty, the internationally-famous manatee raised in captivity longer than any other manatee in the world. The most northerly of all the manatee viewing areas, this 150-acre park is at the headwaters of the crystal clear Homosassa River. It is located 75 miles north of Tampa and 90 miles northwest of Orlando near the Gulf of Mexico and the town of Homosassa. The park has long been known for its 45-foot deep natural spring which pumps millions of gallons of water per hour. The spring is the headwaters of the Homosassa River which meanders for nine miles to enter the Gulf of Mexico. Besides being home to as many as 34 different species offish, the park has become an important refuge for manatees born in captivity. It also serves as a halfway house for injured manatees who can be released back into the wild. Homosassa wildlife park is the only place manatees can be seen in a natural environment year-round. Editor's Note: This article is an excerpt from the book "Manatees - Our Vanishing Mermaids". For more information on the best spots for sighting around the world, check out the full text.